What’s so great about Knockout roses, anyway? The answer: There are too many reasons to count! They’re very dramatic, blooming from spring until frost in most cases. They suffer fewer insect and fungal issues than the old fashioned hybrids; they’re drought tolerant, versatile and easily pruned. There are so many excellent attributes that it’s almost hard to cite anything bad about them. Due to all their positive features they have become one of the most popular landscape plants in the nation. This will ultimately cause their demise. As with any monoculture situation, should a scourge appear, the damage done is many times greater than in a situation where diversity is the rule. In the case of Knockout roses, the affecting disease is Rose Rosette disease (RRD). RRD has been spreading through the United States for the past decade or so. Spread by miniscule mites that are borne on the wind, RRD is a virus that kills infected plants within a couple of years and there is no cure. It is said that hybridizing an RRD resistant variety could take another ten years. If planting a susceptible plant is not of interest to you, we’ve got some alternatives that you may really like. Hydrangea paniculata. There are many varieties that thrive in an array of lighting situations from full sun to partial shade. These beauties achieve a similar size to Knockouts roses, are long, dramatic bloomers and can be readily pruned like Knockouts because they flower on “new” wood. A favorite color is the ‘Quick Fire’, which blooms white and changes to a gorgeous pink or red as the flowers mature. Dwarf Crape Myrtles. There are an incredible variety of crapes already out there and the numbers of dwarf crape myrtle cultivars grow each year. 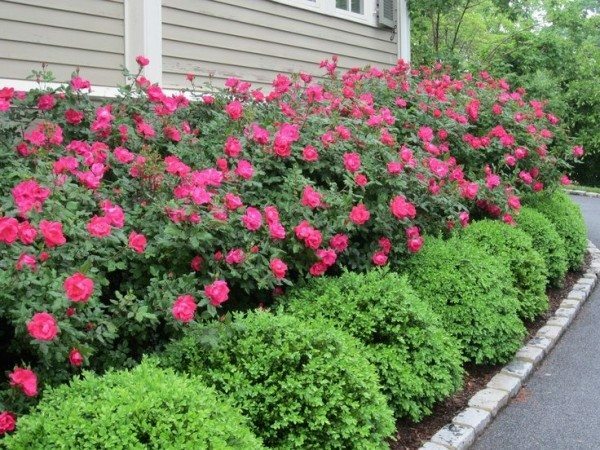 These shrubs can be found in sizes as small as 2’x2′ and in all imaginable colors. ‘Pocomoke’ (a pinky red) and any one of the “Dazzle” series seem to be a fan favorite. Lengthy bloom times, ease of pruning and incredible fall color, make these a suitable sub for Knockouts. Abelia. While not so dramatic flower-wise as the other options on this list, abelias have an incredibly long bloom time, come in a variety of sizes, from 3’x3’ up to 6’ or more, offer some cultivars that are evergreen, even variegated and best of all…fragrant! Knockout roses are a great plant but until there is some progress made toward inoculating them against their specific plague, you may consider one of the above alternatives for your new installs. Happy planting to you!